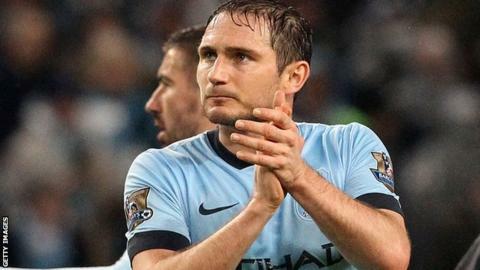 Frank Lampard should be treated like a Chelsea great when he returns to Stamford Bridge with Manchester City, believes his uncle Harry Redknapp. The 36-year-old returns to his old club for the top-of-the-table clash for the first time since leaving in the summer. Lampard is Chelsea's record goalscorer with 211 goals over 13 years at the club, winning three league titles, four FA Cups and the Champions League. "Surely he should get a good reception shouldn't he?" said QPR boss Redknapp. "He has to be one of the all-time great Chelsea players. They've had some fantastic players over the years and he's one of the all-time greats," added Redknapp. Redknapp, as well as being Lampard's uncle, gave him his first opportunity as a teenager when they were both at West Ham. The game pits league leaders Chelsea against their nearest rivals in the title race. But despite a five-point gap between the two, City boss Manuel Pellegrini says the result will not decide who wins the Premier League in May. Manuel Pellegrini said ahead of Saturday's 17:30 GMT kick-off: "I am sure that Frank Lampard will receive the best reception from their fans that they can do. He is a top player, maybe the most important in their history." Former Chelsea striker Chris Sutton told BBC Radio 5 live: "Frank Lampard has been an incredible player. The goals he has scored have been unbelievable and the fact he can still have an influence is great." BBC pundit Pat Nevin said: "I had to play against Chelsea after leaving them and I scored against them. There was enough pain felt for doing it, but there was great respect from both sides. In fact, the Chelsea fans applauded me when I scored." Jose Mourinho, after the 1-1 draw in September, told BBC Sport: "I feel that when a player leaves another club and plays for a direct opponent, he is not going there for a holiday, he is going there to try and beat his club - the one everyone considers the club of his heart, but not any more." How is Lampard doing at Manchester City? Lampard, who retired from playing for England after the 2014 World Cup, has become a pivotal player for Pellegrini's team. He has scored seven goals in 22 appearances this season, including the winning goal in City's 1-0 victory away to Leicester City and in the 3-2 home win over Sunderland. But arguably his biggest impact was a dramatic equaliser against Mourinho's side in the 1-1 draw when the sides met at the Etihad Stadium earlier in the season. Lampard did not celebrate the goal and appeared close to tears when he left the pitch after applauding the away fans. How did Lampard end up at City? Lampard was released by Chelsea in June 2014 when his contract expired after 13 years at the club. He initially agreed to join the new Major League Soccer franchise New York City, which is jointly owned by Manchester City. The former England international then joined the Premier League champions until January before extending his stay until the end of the season. Chelsea Supporters' Groups said that Lampard would not damage his reputation by joining their rivals following his move to City in August. "You always get one or two idiots but the majority of fans will not go against him," said chair Trizia Fiorellino.